The Commodities | Grid Metals Corp.
Lithium-ion batteries are the default choice for most personal electronics and most electric cars today due in great part because they are lighter and have a higher energy density than other technologies. The market for lithium is expected to grow rapidly over the next few years as usage of EVs expands. In 2017 the market penetration of battery powered electric vehicles was less than 1% of global automobile sales. Powered initially by regulatory changes the market penetration for EVs is expected to increase to between 5% and 10% by 2025. Lithium is an integral metal used in all of the main EV battery technologies. At the same time there has been a rapid supply response from industry to bring on more lithium supply from hard rock sources and brine sources of lithium. Supply response has come from both from the established lithium producers and new entrants to the global market. 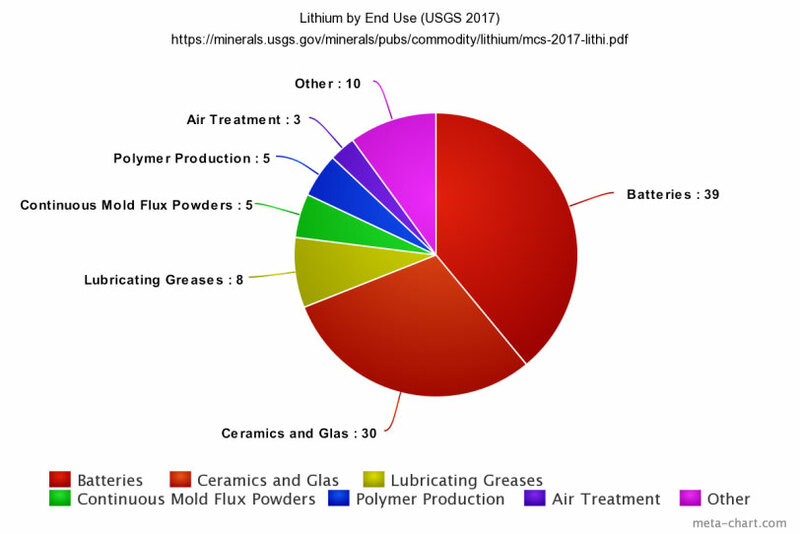 Historically lithium had a broad range of uses in the glass and ceramics manufacturing business primarily because of its unique thermal qualities. A well known example is in glass ceramic stove tops that have to resist thermal expansion This segment still accounts for around 30% of the market for lithium. In many instances the glass and ceramics business is looking for a technical grade spodumene concentrate that has an exceptionally low iron content. Technical grade spodumene concentrate has commanded a very large price premium over chemical grade concentrates in recent years. Grid Metals is focusing on exploration and the potential development of technical grade spodumene concentrates to supply the glass and ceramics markets in North America. Cobalt is an important commodity that is integral to the electric vehicle market over the next decade. Lithium battery cathodes used in electric vehicles are made of layers of lithium metal oxides that contain some combination of cobalt and other metals. Cobalt's unique atomic properties are high energy density enables greater efficiency of the battery cathodes. ( ie more energy into a small space ). Cobalt is also used as a super alloy in aircraft engines and in cemented carbides, which are often used as hard cutting surfaces or drill bits. The super alloys are capable of withstanding high temperatures and stress. In consumer applications cobalt is used in the manufacture of smart phones. A large amount of mined cobalt comes as a by-product of copper or nickel. The majority of cobalt production is mined in the Democratic Republic of the Congo from mines that have significant Chinese ownership and ethical issues involving child labour. There are limited sources of primary North American cobalt from mines that have cobalt as a primary metal. EV manufacturers value source, ethical and environmental standards and security of supply as integral to a long term manufacturing supply chain. To supply this market Grid will look to develop a large and long life strategic supply of ethically produced North American cobalt from mines with cobalt as the primary metal credit. Medium term, if projections of EV adoption are correct the amount of cobalt required will triple by 2025 and there will be a deficit market for cobalt. Nickel is a hard and malleable metal with wide industrial and consumer applications. It is commonly used in alloys which combine the unique properties of the various metals. The dominant use of nickel is to make stainless steel which has growth rate much higher than the rate of overall economic expansion. 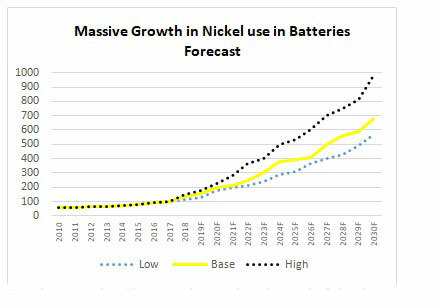 An adoption rate of 10% for EV’s would create a need for 400,000 tonnes of nickel annually which is a significant amount of new supply for a global market that uses about 2.0 Mt of nickel annually. At the same time this major new demand driver is emerging the stainless steel market and overall market for nickel continues to grow briskly. The adoption of nickel laterite ores to make "pig nickel" in China and Indonesia led to new supply of nickel and coincided with the global financial crisis in 2008. This led to a rapid build up of nickel inventories. 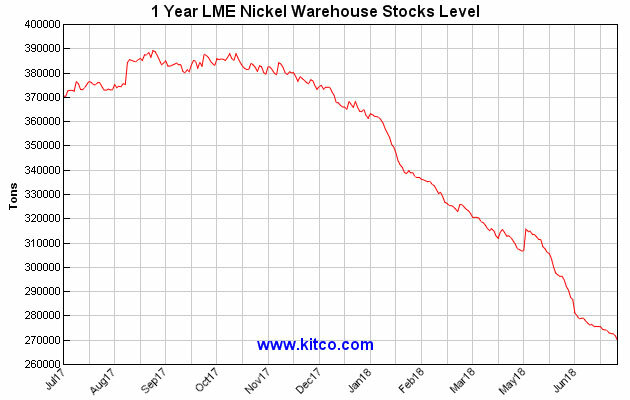 LME nickel inventories peaked at almost 390,000 tonnes in September 2017 but have since declined by over 110,000 tonnes to June 2018. The price of nickel has begun a gradual increase which may be significantly accelerated when stocks of nickel fall. Historically the nickel market has seen significant swings in price that reflects the intensive capital requirements for adding new nickel capacity. 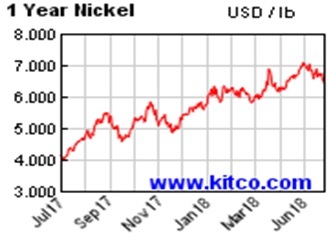 Going forward factors that will promote higher nickel prices include rising environmental standards for production of pig nickel in China, the capital intensive nature of nickel projects, the lack of nickel sulphide projects worldwide and of the increasing demand for nickel in EVs and stainless steel.